Tilly's pretty little Betty Draper-inspired pattern is going to be gorgeous! The only thing stopping her from whipping it up is the lining - there aren't any pattern pieces! Yes, she could just cut the exact body pieces out of the lining and it would work, sort of. She could skip the facings and sew the lining right to the jacket front edge. But if she did, it won't fit properly around the armhole, and it won't be properly reinforced along centre front for the buttons and buttonholes. Never fear! It's easy to make lining pieces out of her jacket pattern pieces. I'll show you how! First, carefully cut out the jacket pattern pieces. Since Tilly's jacket has darts not princess seams, that's what I will show in this tutorial. Don't worry if your jacket pattern has princess seams or other design lines! I'll explain what to do. She also has "F - Collar" but we don't need it for the lining pattern. We'll need the rest, though! Let's start with the Jacket Front. Trace off the pattern piece. In my demo, I've traced around the pattern piece because it's tiny, but in real life you could either trace around your pattern piece, or use tracing paper or lightweight white paper to trace over your pattern piece. Take the facing pattern piece, and line it up along centre front, matching the neckline edges. Mark the facing seamline on your traced jacket front. The line you've just traced from the facing is going to be the seamline that joins your facing to the lining. To add seam allowance, you'll need to actually add TWO seam allowances to the lining pattern piece - for a total of 1 1/4" added to the lining front piece. I've also marked the jacket hemline on the lining piece. I eyeballed where the hemline should be, but Tilly will mark the real hemline amount when she makes her own lining pieces. Much more accurate than mine! Now, add 1/2" to the hemline. This allows for a pleat at the hem of the lining. Or if Tilly prefers to leave the lining hanging free, it will make sure it's shorter than the finished jacket so it doesn't hang below the hem! We'll also add extra to the armhole. Why? Well, have you ever added lining to a jacket and NOT added extra around the armhole? You'll find that the sleeve hem will pull up and pucker all the way up the sleeve seam, and it won't sit comfortably. Adding the extra allows the lining room to go up and over the armhole seam without pulling and straining. It's hard to explain what not to do - so let's add the extra room for Tilly's comfort! Add 1/4" out from the sideseam, and 5/8" up from the armhole point. Here's the finished lining pattern below - I've traced it in RED so it's easier to see. Tilly can cut hers out and toss the extra edges. Next, let's make the lining for the Jacket Back. It's basically the same method as the front, the only difference is adding a pleat to the centre back. We add this pleat for wearing ease and comfort - and also so the lining doesn't rip when Tilly lifts her arms or hugs someone! Trace off the back in the same manner as the front. Lay the back neck facing on the back and trace off facing line. Add two seam allowances to the facing line for a total of 1 1/4" again. Add the 1/2" to the hemline, and the same allowances around the armhole. Lastly, it's time for the sleeve. Easy! Just add the 1/2" below the hemline, and add the armhole allowances the same way we did on the front and back lining pieces. So here they are! Below is a photo showing all three lining pattern pieces, outlined in RED below. Tilly can now follow this easy tutorial to make her own lining pieces, she'll be rocking that cute little suit in no time! So what happens if you have princess seams to deal with? No problem! Before starting on the steps above, tape the jacket pieces together along the seamlines, overlapping the seam allowances. This way you have one jacket front piece and one jacket back piece to work with. Thanks, Tasia! If you don't already read Tasia's blog, this is definitely one to add to your blog role. 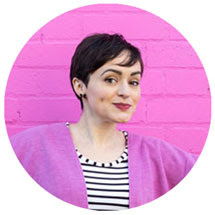 She's a super talented, gorgeous lady with a colourful style and an impressive blog. 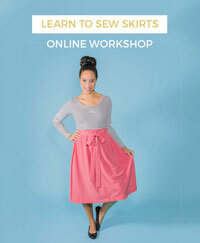 And she's currently setting up her own sewing pattern company to boot!